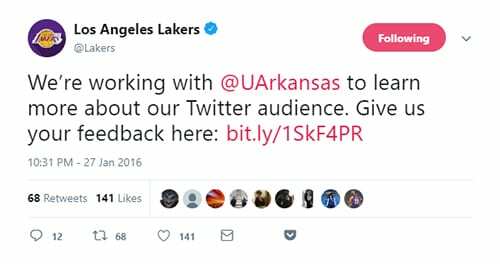 The Lakers organization tweeted the survey from University of Arkansas researchers to its Twitter followers. People from different cultures who follow a team on social media do so for different reasons. That’s the basic finding of research published by a University of Arkansas graduate and three faculty members, and they believe the reasons they found will help sport organizations develop effective strategies to engage users. Bo Li worked in sports journalism for 6½ years before pursuing his doctoral studies at the University of Arkansas. After earning a doctorate in recreation and sport management in 2016 from the College of Education and Health Professions, Li joined the kinesiology faculty at St. Ambrose University in Davenport, Iowa. As part of his dissertation at the U of A, Li published research into the impact of social media on how Chinese sport journalists work in print media and how social media has affected newsgathering. His latest article, based on his dissertation, “Why We Follow: Examining Motivational Differences in Following Sport Organizations on Twitter and Weibo,” was published in Sport Management Review. Steve Dittmore, associate professor of recreation and sport management; Wen-Juo Lo, associate professor of educational statistics and research methods; and Sarah Stokowski, assistant professor of recreation and sport management, co-authored the article along with a fifth academic from Canada. The article fills a gap in research that examines how a market may shape social media users’ motivations in a sport context. It also expands the focus to social media markets in the Asia and Pacific region, where government censorship in countries such as China make inaccessible the majority of international mainstream social media platforms such as Twitter, Facebook and YouTube. In order to reach users in this huge potential market, sport organizations and athletes have begun using Chinese social media platforms such as Weibo. The researchers wrote that Twitter and Weibo, which are both microblogging services, are similar but studies need to take into account that consumers’ involvement may be shaped by their culture, language, customs, values and ideologies. Li’s study used an online survey of users who followed the Los Angeles Lakers on both Twitter (299 people, the majority of whom live in the United States) and Weibo (796 people, all of whom live in China). The Lakers organization tweeted the survey to its followers. The study found that Weibo and Twitter users had different motives in following sport organizations. Lakers’ Weibo followers were highly motivated, more so than the team’s Twitter followers, by gathering technical knowledge, passing time and escaping from their current lives. Chinese people live in a hierarchical society where they tend to rely on authoritative information, suggesting they may be more likely to believe the credibility of information provided the official Weibo account. The researchers concluded that sport organizations should provide a variety of interactive elements to sport fans. Thompson Scientific ranked Sport Management Review the fifth most rigorous journal in the broad discipline of leisure, sport and tourism and the most rigorous in sport management in its 2017 Impact Factors. The ranking is a measure of how often articles from an academic journal are cited in other academic journals as well as the difficulty of getting an article accepted for publication.